Congratulations to Jennifer Betz! She is our lucky prize winner from the drawing! Please stop by the Rolfs Sports Recreation Center to claim your Notre Dame water bottle! Stay tuned for BikeND’s next challenge! The 1,000 Mile Challenge has officially concluded. Congratulations to all riders who participated! A grand total of 1,253.87 miles were biked by eight participants. What a fantastic job! Even though the challenge is over, that doesn’t mean you can’t keep up pedaling in those miles! The prize drawing will take place next week and the winner will be announced and contacted. Stay tuned for more challenges this fall! The 1,000 Mile Challenge is in its last week! Who is going to ride the most miles?! We are at 948.87 miles all together. We are just over 50 miles away from our goal! Let’s knock this challenge out of the water and go beyond 1,000 miles! Check back for the final week results! Challenge ends July 27th. All participants will be entered into a prize drawing! For more information: The 1,000 Mile Challenge. The 1,000 Mile Challenge is more than half way through the challenge! Here are the top cyclists! We are at 693.37 miles all together. We only need three hundred miles in the next two weeks to reach our goal! Keep racking up the miles! Check back for next weeks results! There is still time to sign up! 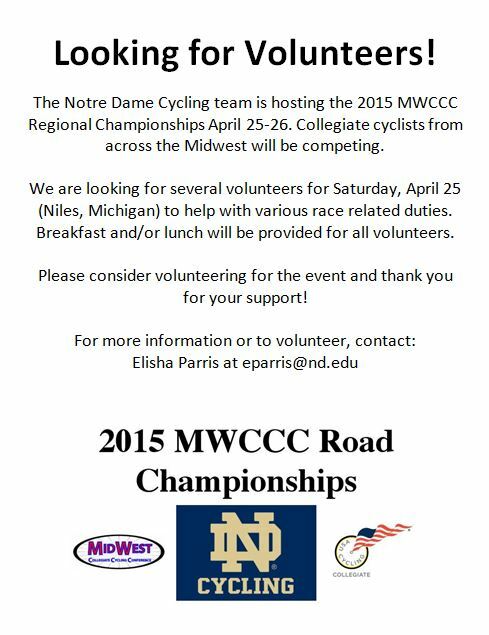 Email lfouts@nd.edu to sign up. Challenge ends July 27th. All participants will be entered into a prize drawing! For more information: The 1,000 Mile Challenge. The 1,000 Mile Challenge is already two weeks in! Here are the top cyclists! We are at 476.37 miles all together, which means… we are almost half way to our goal! Keep racking up the miles! Check back for next weeks results! 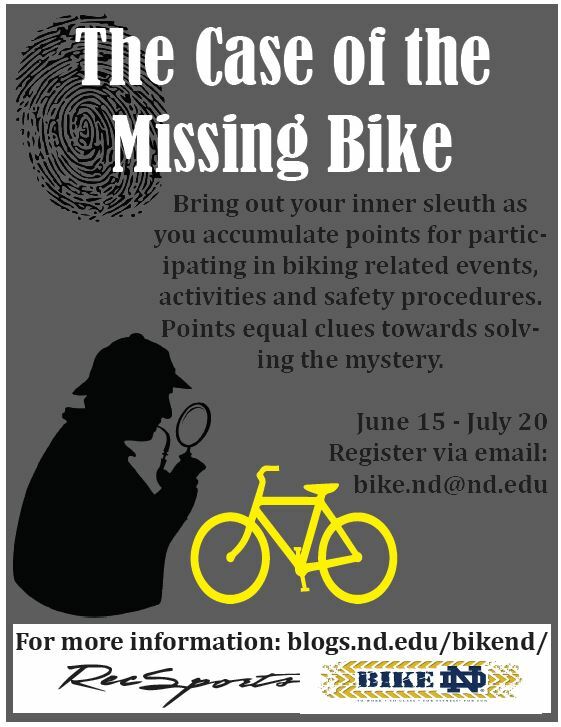 Students whom plan on riding and keeping their bikes on campus throughout the summer MUST obtain a summer bike tag from NDSP (this is in addition to your standard bike registration). This tag helps officers distinguish bikes in use from those abandoned and forgotten by departing students. 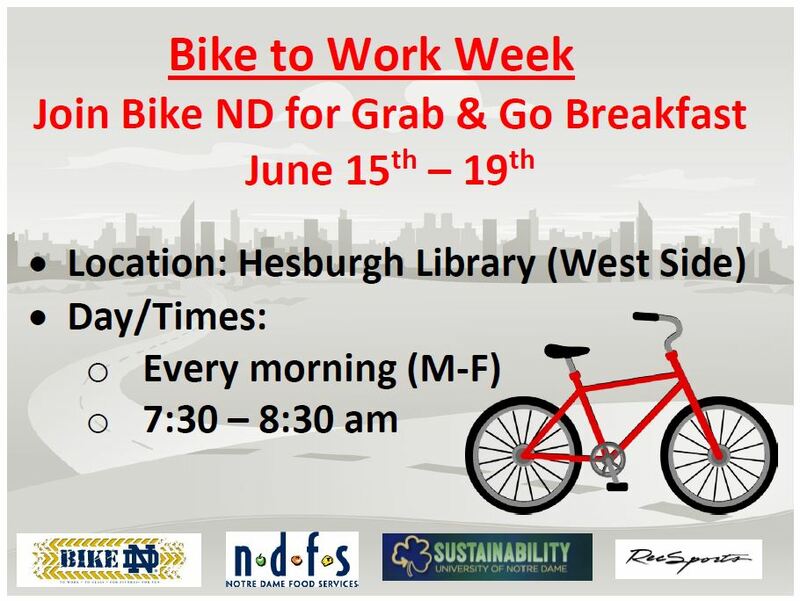 To obtain a summer tag, please take your bike to the NDSP offices in Hammes-Mowbray Hall. For more information: NDSP.